UPDATE: Youtube is now working on all mediaviewers! Either activate 'Youtube Streaming' in settings and have the same experience as all other youtube streaming TV's. Or stick with Viewer 2/Snowglobe and the official youtube player, the more future proof, but less easy option. You might have noticed, for a week or so, your Damani Mediaviewer (or any media device in SL) went to 'black' when trying to play Youtube Videos. In their infinite wisdom - or more to the point; corporate greed - Youtube has blocked the way that videos were originally played in Second Life. YouTube exists of showing you advertisements. If you don't use their official viewer (whether it's on their site, or embedded in a web page), you deny them the opportunity to show you those ads, directly cutting into their revenue model. So why does this affect SL? The current SL clients (1.23, Emerald etc.) are not able to use the Adobe Flash plugin. As Youtube needs Flash to actually display the videoplayer, Youtube simply doesn't work on those clients. The only thing that works is a technique used by all the youtube download sites: A server grabs the youtube page, and figures out the location/url of the real (MP4) video stream. 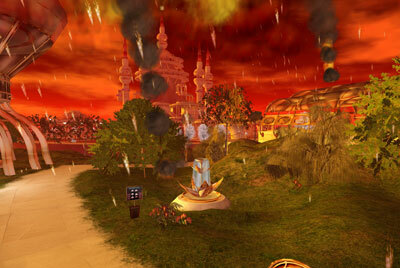 Then this server sends this location to all the SL clients which then play that stream. As said, youtube doesn't like people downloading/streaming clips directly, outside of their control, so this is now blocked in the following fashion: If you grab the webpage, you need to now do this on exactly the same computer as you are going to view the video. If these machines differ, as they do with the separate server, the video simply doesn't play. Sadly, it is currently not possible to 'fix' this. This is not a 'bug' or a technical issue. Youtube is actively blocking the access from 3rd party servers. The only way to 'fix' is by illegally cracking or circumventing Youtube's security and encryption scheme. Besides this being very very complex and taking a huge amount of processing power, it is also illegal. But, other TVs have fixed it. 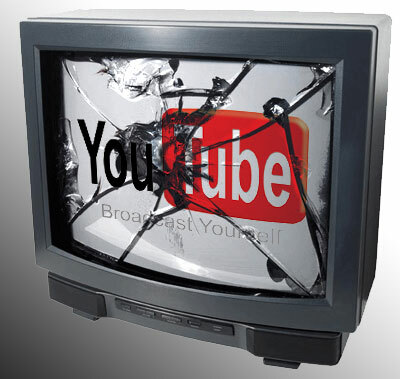 There are TV makers that sell working Youtube TV's, even on old clients. They have not 'fixed' anything. It is still possible to play a Youtube video on any sl client, just by putting a streaming server between youtube and the clients playing the videos. You can download the video from youtube onto the streaming server, then upload/stream it from the server back again to all the people watching. Basically, your server is now playing both the youtube user and youtube itself, both downloading and streaming every video. As you can imagine, this process eats TONS of bandwidth (double the amount for each and every video watched per person). My calculations, after some tests, came to having to need over 5TB (5000 GIGABYTE!) of bandwidth each month. To buy these amounts of bandwidth/servers, would require dedicated servers costing 100s to 1000s of dollars per month. That is a cost we sadly can't make, while still selling the viewer for only 495L$. We would have to raise prices extremely, just to break even, and basically we would have to have all new customers pay for everybody else watching Youtube on their already purchased MediaViewers. We think this would be a bit unfair too. So how about these other TVs... did they really buy all that bandwidth for hundreds of US$? They are often using cheap 'unlimited bandwidth' hosting sites. These sites offer the option to use as much bandwidth as you want as a marketing ploy, knowing that most simple websites only consume a minute fraction of their bandwidth. They sadly often do not allow 'proxying' in their small print either (the process you need to copy the videos). These hosting companies are generally pretty unwilling to pay for your bandwidth needs in the end, if you go start using huge amounts of it. So most of them often close down accounts/sites that do proxy, or at least block them from doing so. We know this for a fact, as we tested this. It is sadly a slippery path to take, and there is the continued risk of needing to switch hosts. 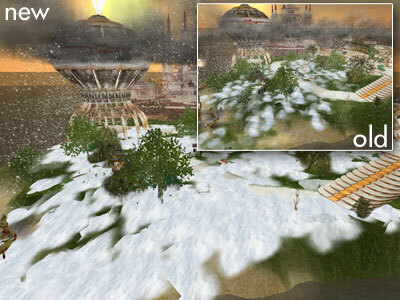 SL Viewer 2 Beta has a completely new interface, some people prefer it, some people don't. 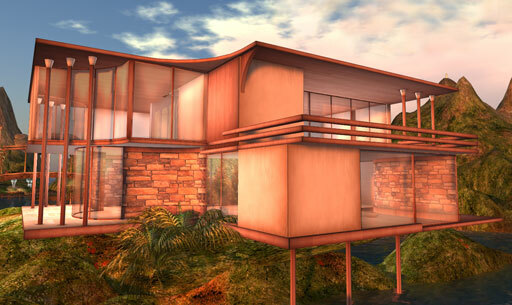 You can find more info and download SL Viewer 2 BETA here: https://secure-web31.secondlife.com/beta-viewer/. 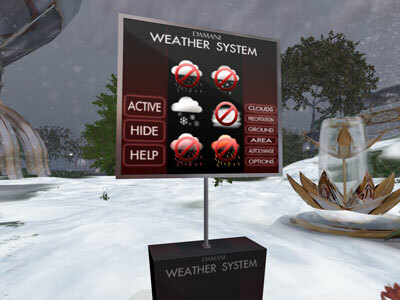 SnowGlobe is an open-source browser, which is an enhanced version of the current SL client 1.23+, use this if you want to keep everything the same, just with youtube playing. Make sure to select the correct operating system and select: Flash Player 10 for Windows - Other Browsers (the bottom option). Due to the completely new display/video type, making an auto playlist do not function correctly right now. Everything else works fine, including full screen, youtube etc. It has been rezzed on my work platform for months, while I was busy with 1001 other things. Luckily, the last few days I went through the pain of finishing it up, putting it into a rezzer, and making it available for sale. 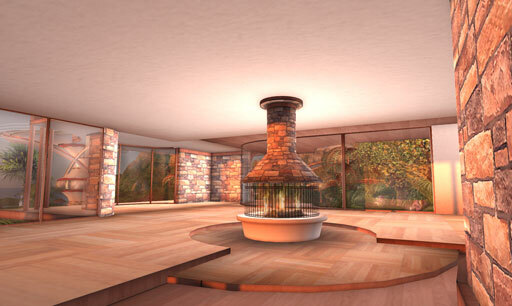 The Bellmare is a custom shaded and textured design in woods and stone. 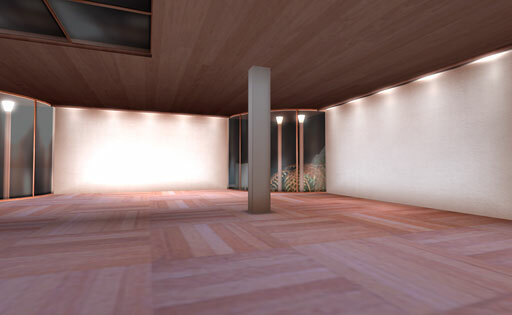 It offers two large floors, decks, a lot of (tintable) large windows, including a skylight, built in atmospheric lights and a lot more nifty little things. All in 109 prims. And now during the first few weeks, for under a 1000L$. 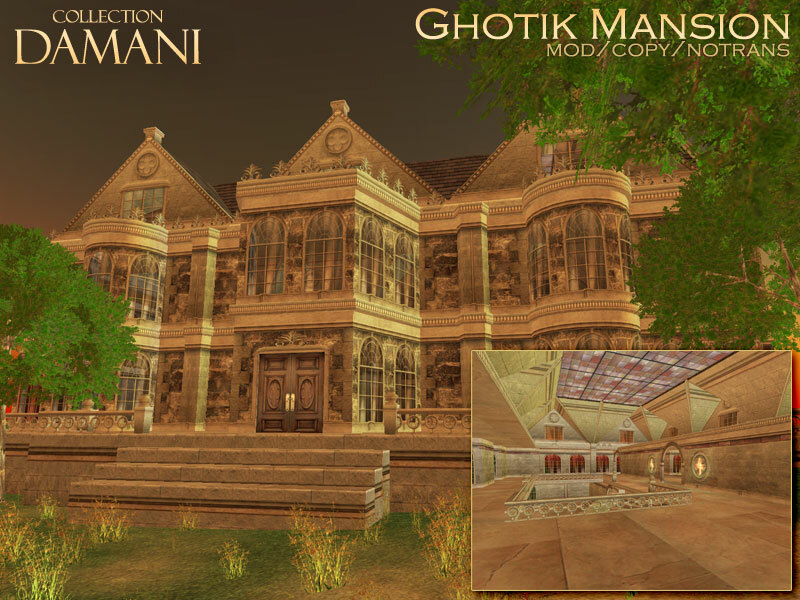 Visit it here in second life. - Built in lights, integrated in control system and auto night mode! A few days ago I released a mediaviewer for SL. 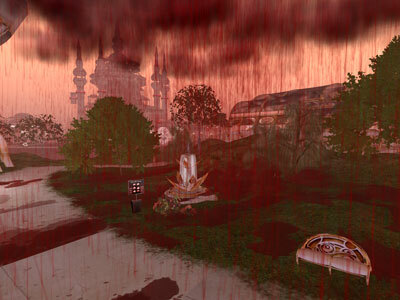 So, first question... with the 3 zillion media players already in SL...WHY? 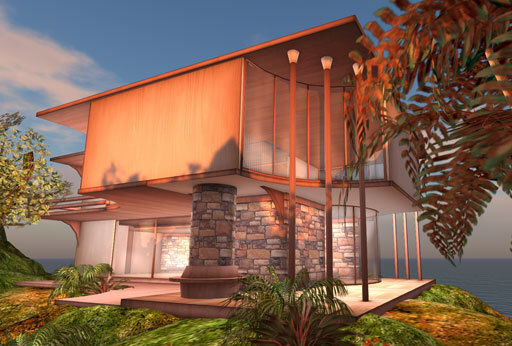 Well, because SL now allows a lot more stuff to be done with external servers, media and prims. So, second question... what stuff? Well, it's now possible to display web pages as media, it's possible to register positions of touches on prims, it's possible to play MP4 etc, with the latest quicktime. Well, it allows me to create a system that basically works like your set top box at home, or your browser. 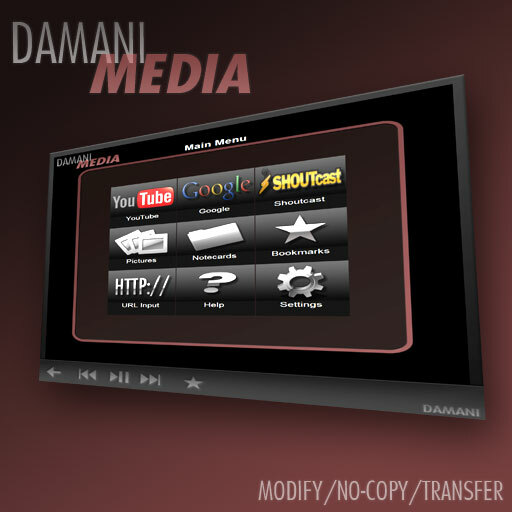 By combining server input and media display of web pages, it's possible to completely control the media from the 'screen'. So, third question, why would I want this? Well, because it then allows you to finally make an EASY system. No complex controls, no commands, no blue menus to select stuff etc. And full support for Youtube, Shoutcast, Google search, Notecards, Bookmarks etc. etc. Ok... final question... a lot of words... but can I actually see what you mean?